urrounded by balloons, streamers and cupcakes decorated to resemble the Puerto Rican flag, Lymaries Velez begins to cry. The second-year medical student is explaining why she started the Puerto Rico Relief Initiative, a coalition of UF medical students, faculty members and undergraduate students aimed at providing the Puerto Rican people with the supplies and funds they need to rebuild their island in the face of Hurricane Maria’s widespread devastation. Velez’s own family was forced to relocate to the mainland U.S. after the storm destroyed their home. Velez introduced two third-year students from San Juan Bautista School of Medicine, Elsa Rodriguez and Brian Torres, who recounted their experiences on the island before, during and after Hurricane Maria, which made landfall Sept. 20. The UF College of Medicine sponsored the pair’s clinical rotations, allowing them to continue their medical training without delay. “Things were already difficult before Maria hit because of Hurricane Irma,” Rodriguez said. She said the hardest part of the storm was the lack of communication she had with her family in Miami. A few days after the storm, she and Torres took a Royal Caribbean humanitarian cruise ship to Florida. While on board, the pair volunteered with the ship’s medical team, performing health screenings and cleaning wounds for the other passengers. “It was a great opportunity to see people come together to help others,” Rodriguez said. After Rodriguez and Torres spoke, attendees were treated to lunch, followed by Zumba and salsa dance classes. Velez said the event was intended to honor the joy and resiliency of the Puerto Rican people. 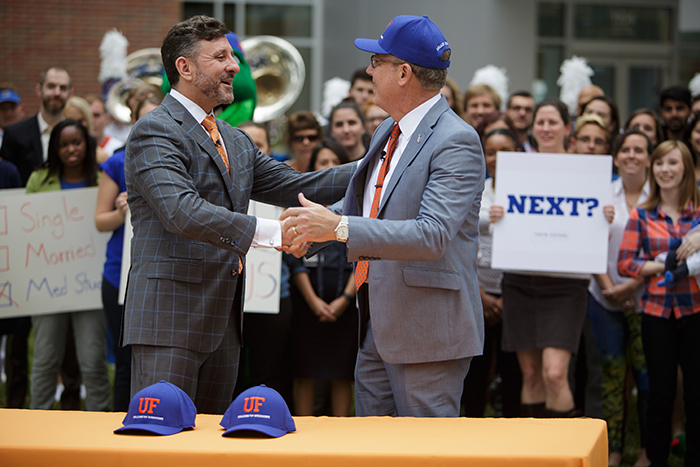 Maria Velazquez, MD, director of the UF College of Medicine Anaclerio Learning and Assessment Center, assisted Velez in her efforts to begin the initiative. Velazquez’s mother and four siblings live in Puerto Rico. To learn more or get involved in the initiative, contact Lymaries Velez at lymaries@ufl.edu.